Lee’s Update: Not sure what happened because I was seeing it okay on PC and smartphone. Anyway, it is now back to the way I normally add the photos back in. A late bird of the week I regret, but I’ve been planning and designing a major overhaul to the website to the exclusion of almost everything else. The website is showing its age as I designed it in a pre-smart phone and pre-tablet era – seems like a long time ago now – for fixed, landscape screens. About 30% of the birdway website traffic comes from such devices now, so it’s an issue I can no longer ignore. Anyway, I’ll say a bit more about that later and provide an example of the new layout. The other revision taking place is that until now I’ve only included my own photos, so Birdway has been synonymous with Ian Montgomery. The rationale was that it was a showcase for my work – some would say a monument to my ego, smile. Maybe I’m satisfied at having reached 1500 species globally and 700 Australian ones so it’s time to change. Birdway will now aim to provide the best range of publishable quality bird photos. Initially the emphasis will be on Australian ones, but later I may extend this to Australasian one. For manageability, I’m starting by invitation only but feel free to register your interest by email ian@birdway.com.au. 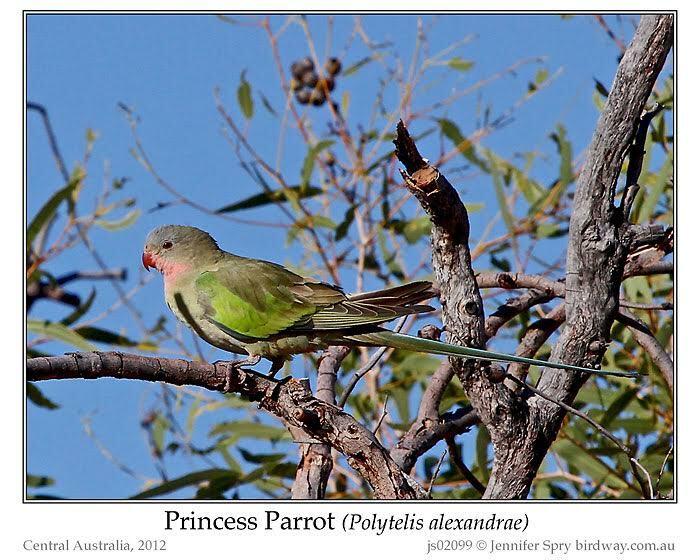 So, here is a landmark bird of the week: these lovely photos of the gorgeous and elusive Princess Parrot were taken by my friend Jenny Spry, a birder and photographer well-known in Australian birding circles. She leaves no stone unturned and no bush or remote island unchecked in a passionate search for the unusual and has one of the longest Australian life lists (aiming for 800!). 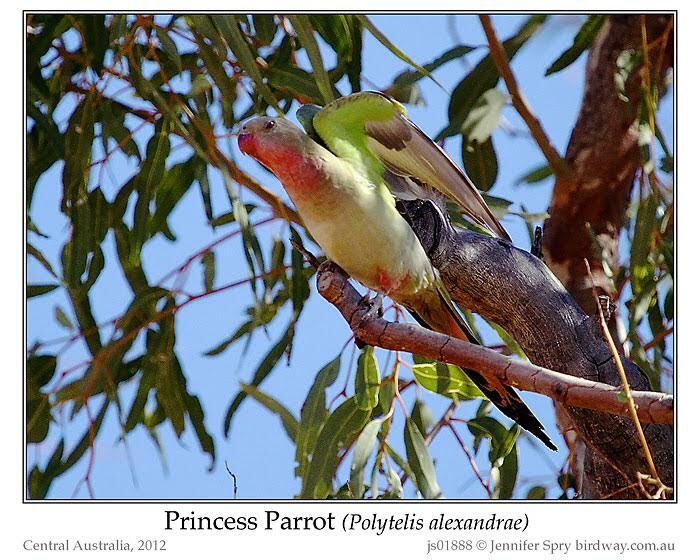 The Princess Parrot is elusive for at least two reason. The first is that it’s a bird of very remote parts of arid Australia accessible only with considerable difficulty, e.g. the Canning Stock Route. The other is that its population and range varies greatly with rainfall. In poor seasons it is almost impossible to find, but in good season the population irrupts and it can appear in more accessible locations, perhaps I should say slightly less inaccessible ones, in inland eastern Western Australia, the southwestern Northern Territory and northwestern South Australia. The core breeding range is thought to be around Tobin Lake and in the Great Victoria Desert, both in eastern Western Australia. It is one of three beautiful, long-tailed, medium sized (length 34-46cm/13-18in) parrots belonging to the endemic Australian genus. Polytelis. 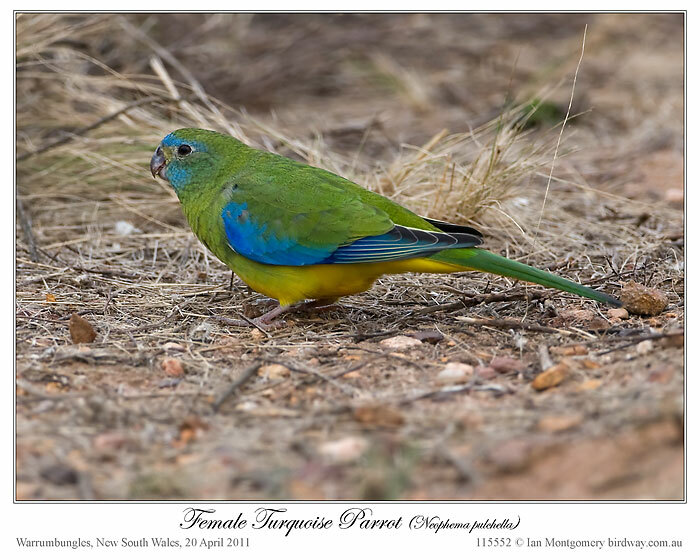 The others are the Superb Parrot of New South Wales and northern Victoria and the Regent Parrot which occurs in two separate populations, one in southwestern New South Wales, northeastern Victoria and eastern South Australia and the other in southern Western Australia. All three species are uncommon: the Princess is classed as Near-Threatenedand the Superb as Vulnerable, while the Regent is uncommon in the east and declining in the west. 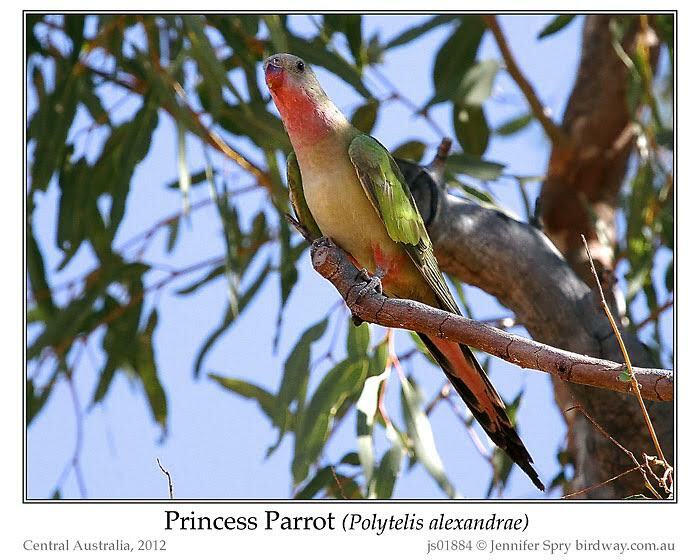 Male Princess Parrots, first two photos, have longer tails and brighter colours than females (third photo). 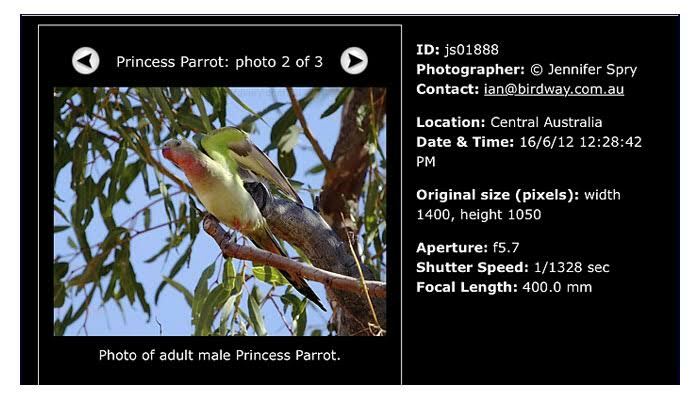 Returning to the subject of website design in a mobile world, I’ve used the Princess Parrot as the first species in the new design and it was posted to the birdway website this morning. The changes will be more obvious on smart phones and tablets, but on computers you’ll notice that the thumbnails have moved from a vertical column on the left to a horizontal row on the bottom and the information about the photo has moved from left to right. You’ll also see a button at top right which reveals – and hides – the main navigation menu as vertical column which slides the rest of the page to the right. Previous, this menu didn’t appear on the pages of individual species, only – as a row of horizontal buttons at the top – on the family pages and the ten main topic pages to which these button link. The fourth and fifth images are screen shots from my iPhone. The fourth shows a page in landscape orientation. The image shrinks to fit the screen width and you can see the rest of the page by scrolling up and down. Note that the photo information is still on the left. The fifth, shows the page in vertical orientation with the navigation menu showing as a grey column on the left. The photo information has dropped below the image and both the menu column and the main window are scrollable independently. These pages are, of course, still prototypes and there will be more changes before I apply it more generally. I’ve tested it only using the Apple browser Safari on a Mac, an iPad and an iPhone. 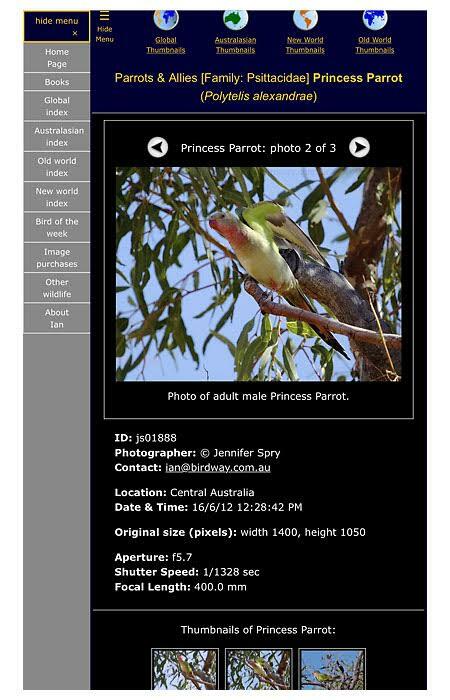 I’d be very grateful if you could try it out on different platforms (Windows and Android particularly) and in different browsers (Safari, Windows Explorer, Chrome, Opera, Firefox and Mozilla are the most important) and report back to me with any problems: http://birdway.com.au/psittacidae/princess_parrot/index.htm. 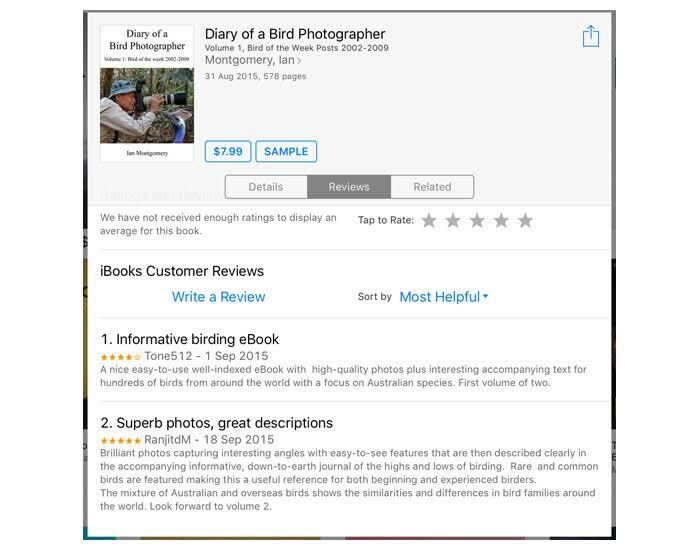 On the subject of books, the Diary of a Bird Photographer has sold about 50 copies in the first month, and review are beginning to appear (below on the Apple store) I’m hugely grateful to those who have done reviews and would love it if some of you would. I think there were problems posting review to the Apple store, but these seem to have been fixed. If that is your experience let me know ian@birdway.com.au and if your very patient, try again. Thank you. 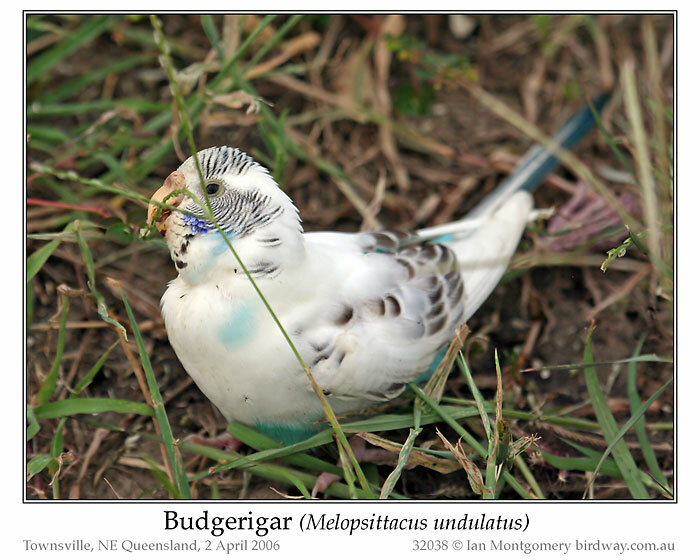 These images should link to the relevant pages on the Birdway site. Very interesting Parrot and apparently quite a change to Ian’s Site at Birdway. I’ll be checking on permission for further usage of his guest photographer. For now, I trust using this latest newsletter of his is under his permission to use. What a beauty this parrot reveals. Subtle in colors, but very attractive. Judging by the number of emails that I received about Pied Butcherbirds, iconic species are popular and there were many interesting stories about experiences with them. 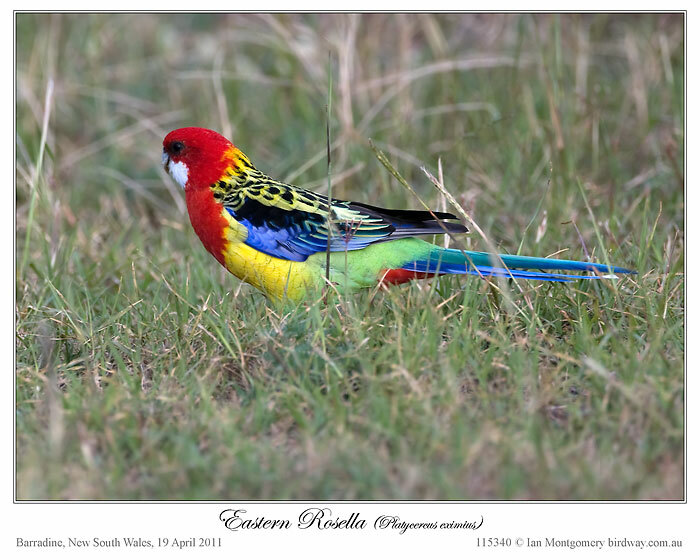 So here is another, perhaps globally the most familiar Australian bird. Although it’s quite common and sometimes very abundant after good rains in the drier parts of Australia, you have to go out of your way to find it. So it it’s much less well-known as a wild bird than say other iconic species like Australian Magpie and Laughing Kookaburras that turn up in backyards. 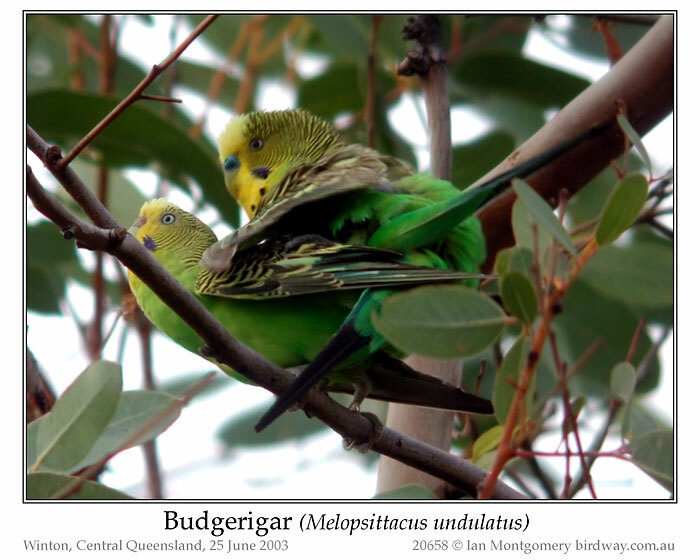 It wasn’t until after I moved to North Queensland in 2002 that I first saw them in the wild, and that was on a trip to Moorrinya National Park between Torrens Creek and Aramac, 370km southwest of Townsville. In places like that you usually see them in small flocks of maybe 10-20 in rapid undulating flight. These make sudden turns in the sunlight showing alternately green and yellow in a characteristic and delightful display of vivid, fluorescent colour. The sexes can be distinguished either by differences in behaviour, sometimes subtle as in the first photo with an attentive male and a bored or playing hard to get female, or less subtly as in the second photo. Her the male is concentrating seriously, and the female is rather inscrutably either in a state of bliss or thinking of the motherland. 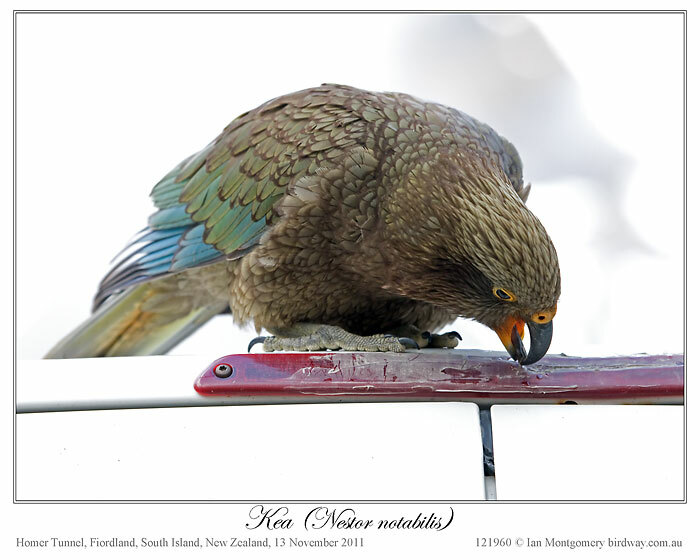 An easier way though is by the colour of the cere – the tissue surrounding the nostrils – blue in adult males, and brown in females. Juveniles have duller plumages, barred foreheads and lack the black spots on the neck. 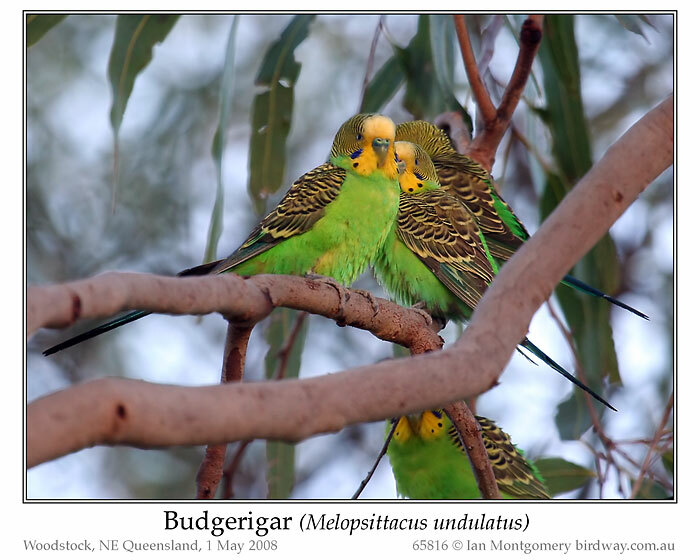 After good inland rains, the population can explode and Budgerigars may be seen in flocks of thousands. When dry conditions return and seeds become scare, flocks wander far and wide in search of food. They move into areas beyond their normal range and can turn up in coastal areas such as near Townsville. 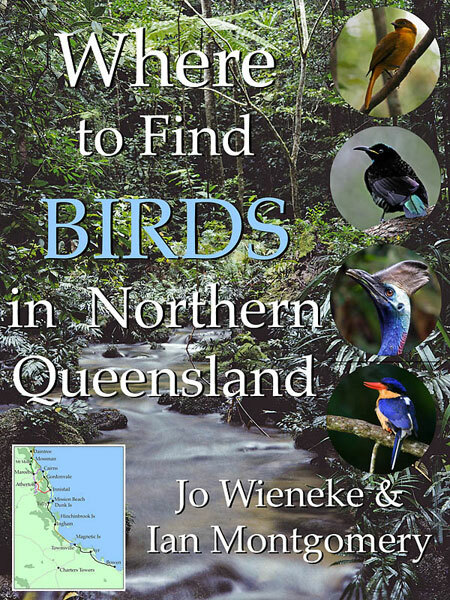 The birds in the third photo were near Woodstock just south of Townsville on the way to Charters Towers and I have seen them near Bluewater. Sometimes escaped cage birds turn up in odd places in strange colours, such as this almost completely white one near the Strand in Townsville. I don’t know about you, but I prefer the natural colours. I was in Ireland once for a family funeral in February and was birding on Dun Laoghaire pier in Dublin Bay on a very cold, dull winter’s day, when I spotted a bright yellow budgie looking very out-of-place among some roosting waders. It was a moment of great empathy and I thought ‘you and I should be back in sunny Australia’. I’m in Melbourne at the moment to visit East Gippsland next weekend with my Victorian birding pals who know of a good site for both Greater Sooty Owls and Masked Owls (both cousins of Barn Owls) near Orbost. I haven’t seen or photographed either of these, so may I request your customary friendly support and spiritual goodwill to help us find them? It would be lovely to be able to bring at least one of them to you as the next bird of the week. Ian is correct, at least for me. 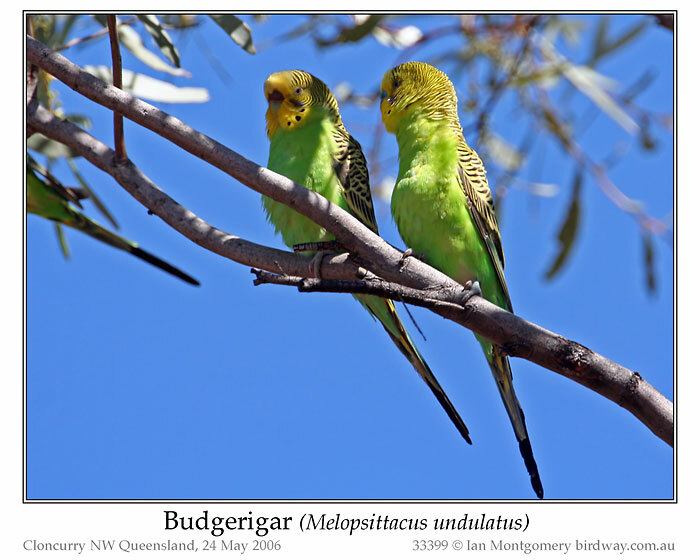 The Budgerigar or “Budgie” as I was taught, was one of the first bird names I ever knew. Almost everyone I have ever seen was in a cage or aviary. Few have been pets and one was sitting on someone glasses look down into their lens. But, to see them in the wild where they live would be a great experience. Thanks, Ian, for again sharing your adventures with us. The most I have ever seen at one time has been at Lowry Park Zoo. I’ll also be praying that Ian finds those Greater Sooty Owls and Masked Owls so that he will share them with us on another Bird of the Week. After I finished the Birds of the World – Kingfishers, Australasian Warblers, White-Eyes and Doves article last week, I decided to finish up the Psittacidae – Parrots Family. I still needed 150 photos or drawings to complete the 363 species needed. Well, last night, it was finished and at 100% for images. 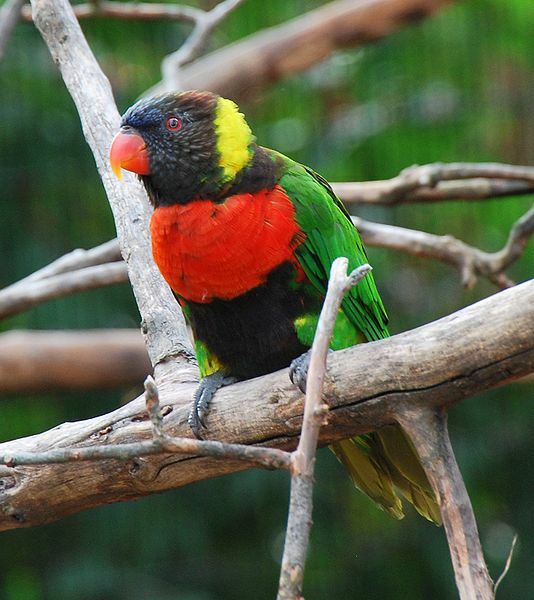 Looking at all those Parrots and others in the family, they definitely have “Coats of Many Colors” also. Just wanted to share their beautifully created plumage also. 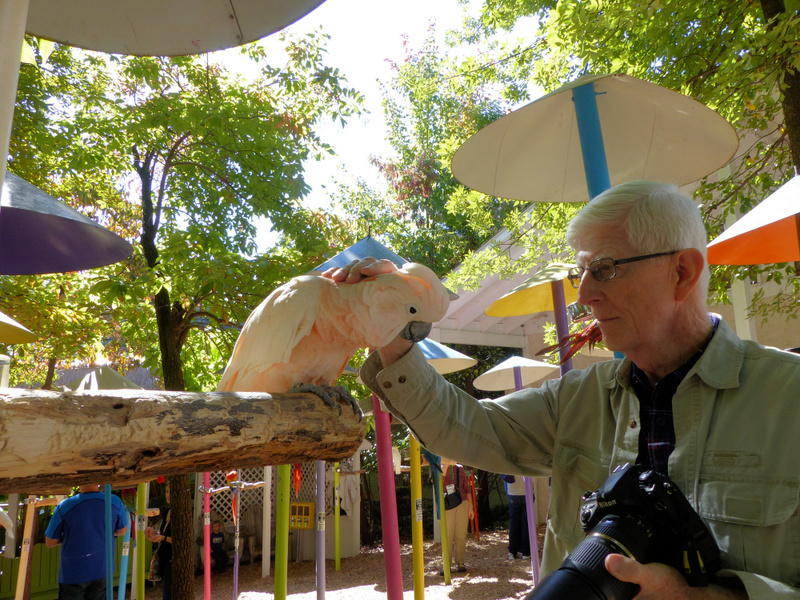 Most of us are familiar with parrots and parakeets. Many have them as pets or have seen them in the wild. So you are sort of familiar with them, but I am sure as you view the slideshow, you will see many that you haven’t seen before. I also want to share the only birds I had personally. My preference is that the birds roam free, or are being kept from extinction in zoos or other similar situation. There is nothing wrong with having a pet, but I am just stating my preference. 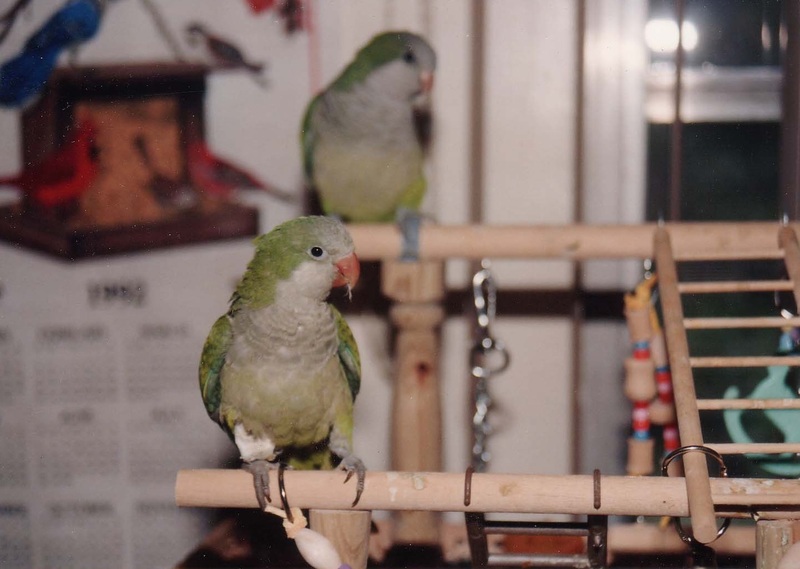 We ended up with two Monk Parakeets when we lived in south Florida. They are wild down there (up here also), but one day the neighbor boys came to my door and told me about an injured Monk Parakeet. A teenager had shot it out of a tree and the smaller boys found it. They said, “You love birds and you will know what to do.” That began the adventure with my bird. I had never kept a bird in my life, but knew that my veterinarian was also a bird vet. Long story short, I ended up with a one-winged bird that could never go back to the wild. My “free bird” ended up costing over $200 for vet bills. (This was over 20 years ago). Dan wanted to call it “One-armed Bandit” because it cost me so much, but I took the “t” off of “Bandit” and it became “Bandi.” I think it was a “she” because she was so sweet. Well a year later, my friend bought two Monks and told me there was one more, but it had a deformed leg. Another long story short, I bought “Hoppy” for $25 and ended up spending another $200 getting a broken leg repaired. It was an amazing surgery the vet performed. “Hoppy” had to be a male, because he could be mischievous at times, but he learned to talk and was quite enjoyable (most of the time). The picture shows “Hoppy” with the bandage in front and “Bandi” in the background. 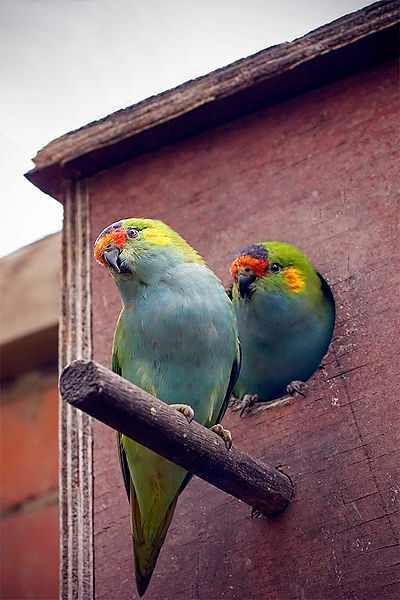 Back to the Coats of Many Colors, below is a slideshow showing some of our beautiful and personable members of the Psittacidae – Parrots Family. 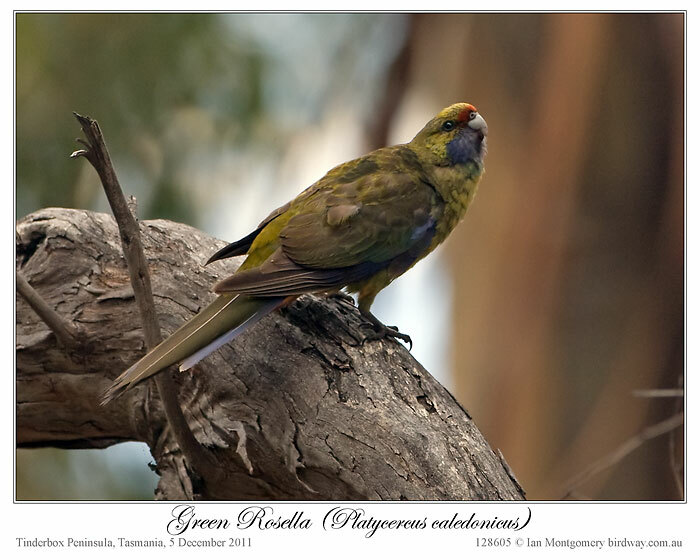 The two recent Tasmanian birds of the week seem to have been popular so here is another one, the Green Rosella. I spent an enjoyable week in a rented campervan in Tasmanian in December 2011 on the way back from the Sub-antarctic trip chasing Tasmanian specialties. After that trip, the Tasmanian species got somewhat eclipsed by the penguins, albatrosses and other seabirds as choices for bird of the week, so I’m making amends now. 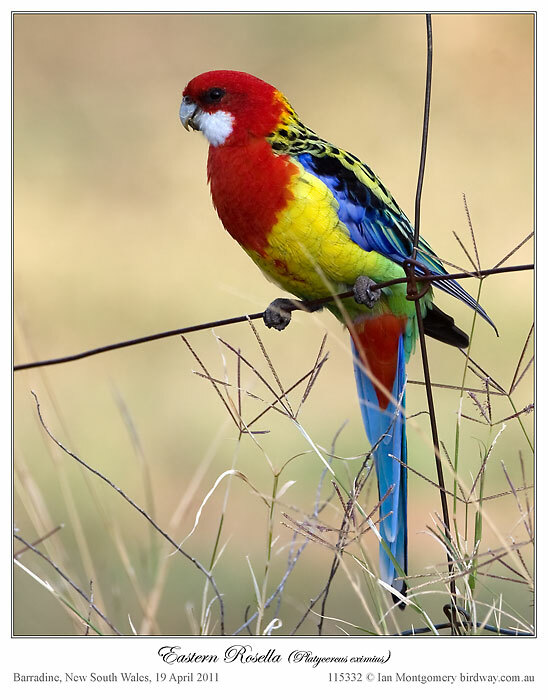 At up to 37cm/14.6in in length, it’s the largest of the Rosellas, being marginally larger on average than its close relative the Crimson Rosella which it replaces in Tasmania and some islands in Bass Strait. Males are generally larger than females and there are subtle between the sexes with males having relatively larger upper mandibles and broader heads (first photo) and females having more orange on the cheeks (second photo) though most of the field guides don’t distinguish between the sexes. Juveniles, third photo, are more distinctive with duller more olive plumage and, in flight, pale wing stripes. This bird was in the company of the adult in the second photo, and the one in the first photo was in the same area, so I assumed that they comprised a family. 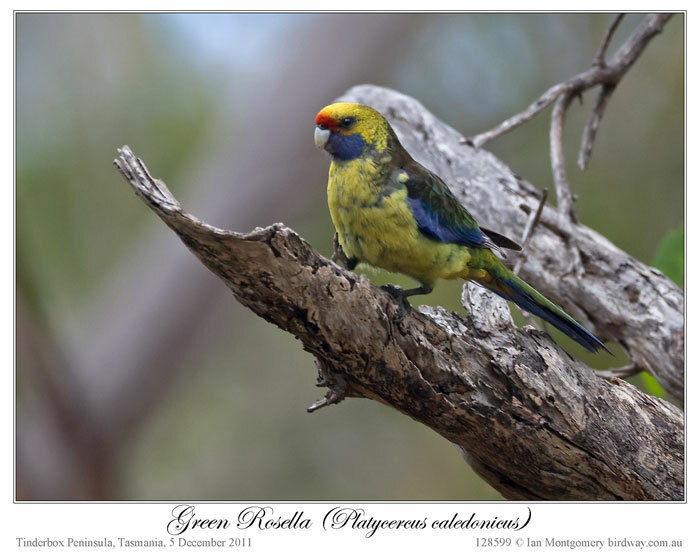 Green Rosellas are quite common throughout Tasmania, showing a preference for highland forest, though these ones were near the coast on the Tinderbox Peninsula south of Hobart, a good place to search for all the Tasmanian endemics. The specific name caledonicus was used by the German naturalist Johann Gmelin in 1788, who mistakenly believed that the type specimen had been collected in New Caledonia. 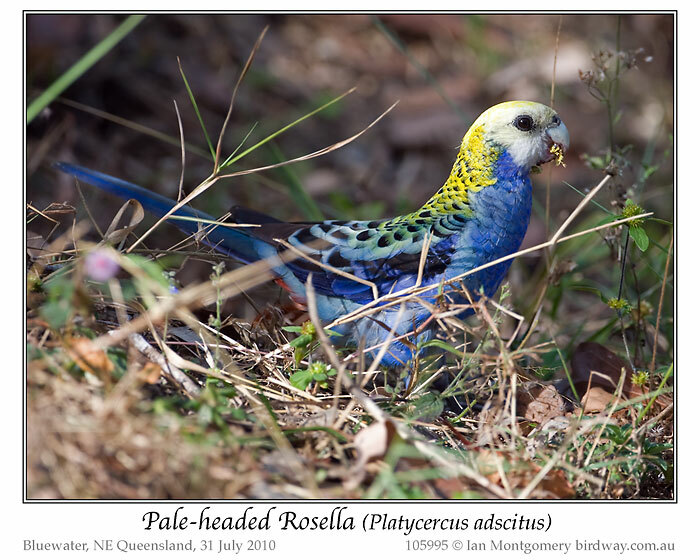 Confusion is the name of the game in Rosella terminology, and species boundaries have changed over the years. 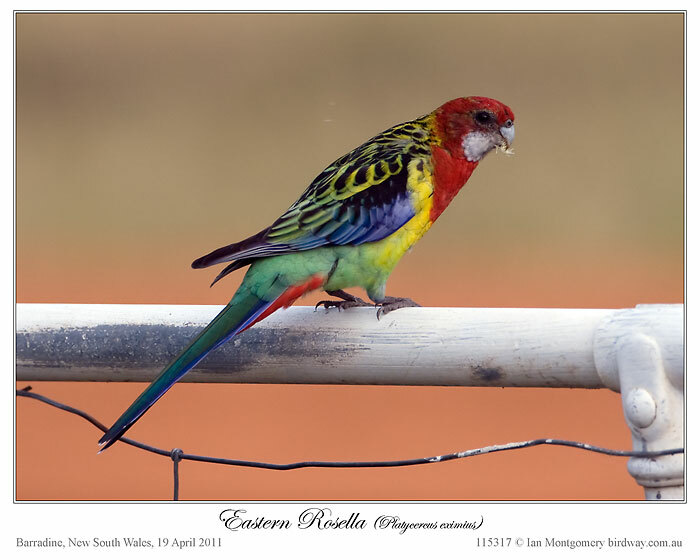 The Crimson Rosella has two races which differ greatly in plumage and both the ‘Yellow Rosella’ of Southwest NSW and the ‘Adelaide Rosella’ of South Australia have been regarded as separate species in the past. 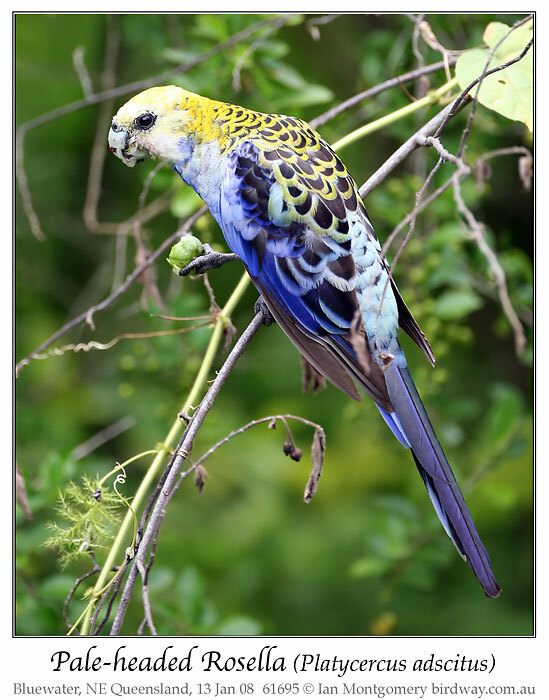 The Yellow Rosella (fourth photo) looks quite like the Green Rosella – and not at all like a Crimson Rosella – but the Green, given its geographical isolation, has been given the benefit of the doubt and retained as a separate species. This is just as well, politically anyway, as it’s the avian symbol of Tasmania and deserves a certain status. 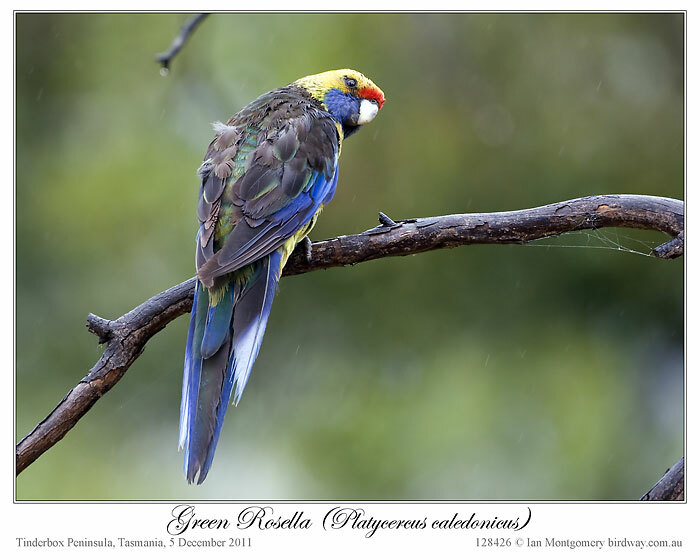 The Green Rosella is sometimes referred to as the Tasmanian Rosella, probably as Ian mentioned because it is the Avian Symbol of Tasmanian. 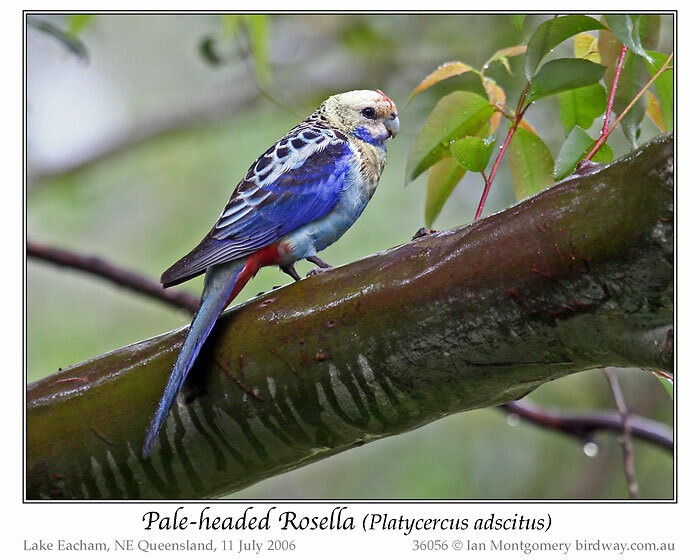 The Green and “Yellow” Crimson Rosella are part of the Psittacidae – Parrots Family. What gorgeous birds belong to this family and they show the Handiwork of the Lord at some of it’s finest. Their diet is composed of seeds, fruit, berries and flowers, as well as insects and insect larvae. 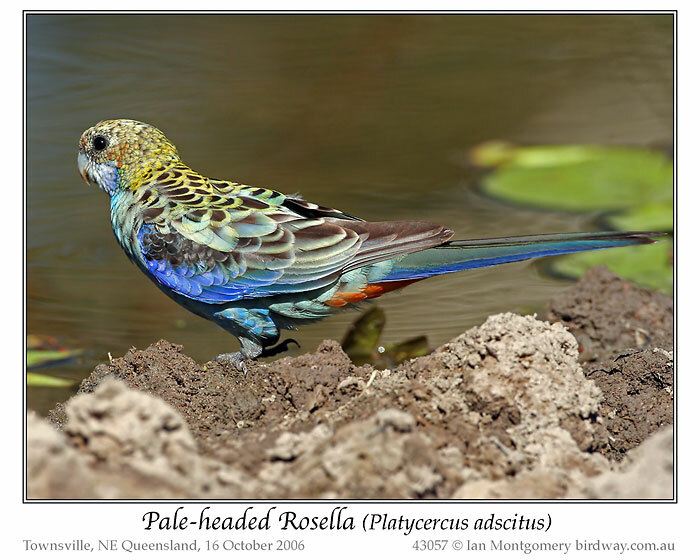 The Green Rosella is predominantly herbivorous, consuming seeds, berries, nuts and fruit, as well as flowers, but may also eat insect larvae and insects such as psyllids. They have also partaken of the berries of the common hawthorn, as well as Coprosma and Cyathodes, and even leaf buds of the Common Osier. The seeds of the Silver Wattle (Acacia dealbata) are also eaten. The breeding season is October to January, with one brood. The nesting site is usually a hollow over 1 m (3 ft) deep in a tree trunk anywhere up to 30 m (100 ft) above the ground. A clutch of four or five white and slightly shiny eggs, measuring 30 x 24 mm, is laid. The nestlings leave the nest around five weeks after hatching and remain with their parents for another month. 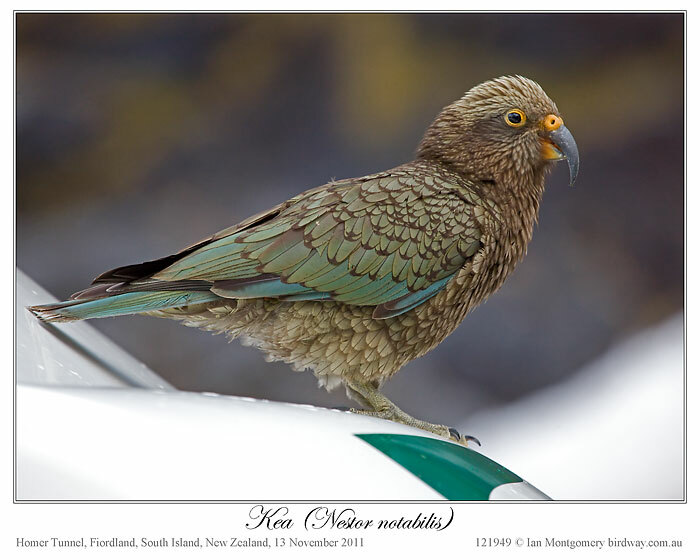 If you park near the entrance to the Homer Tunnel on the way to Milford Sound in Fiordland on the South Island of New Zealand, you are likely to be approached by one of these interesting-looking parrots. ‘Friendly-looking chap’, you might think, ‘I wonder what he’s after? Just saying Hello? Some food maybe?’. Wrong. 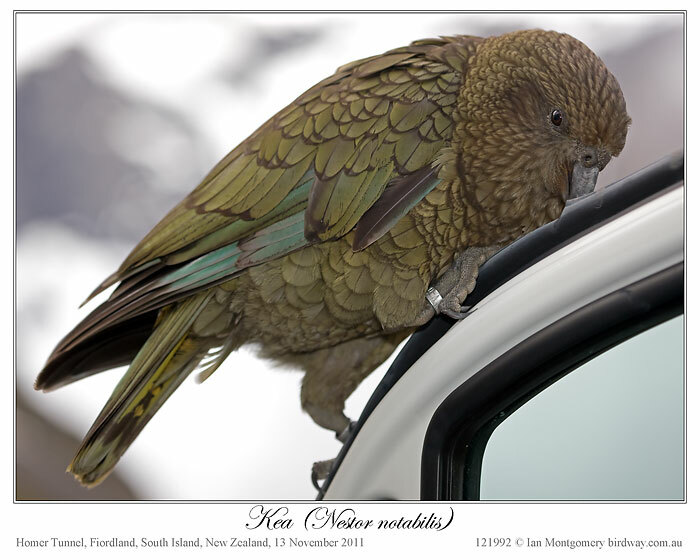 This one, the Kea, has a one-track mind, and is only interested in destruction, or more specifically dismantling your vehicle. Quick as a flash, it and his pals will check it out for weak spots and set to work – this one with yellow cere, lower mandible and eye-ring is a juvenile delinquent (yes, that’s snow in the background, these are tough birds). Let’s see if we can rip the roof off. Oh well, the roof was stronger than it looked. How about the braking light above the back door, this has some promising cracks. Meanwhile, this hardened criminal (this is an adult bird) has learnt that the rubber is more vulnerable and attacks the lining of the front door. And don’t think you can get rid of us by just driving off. We’ll hang on grimly until we get blown off by the breeze. Keas have the reputation of being playful, but the intensity and obsessiveness of their attacks looked anything like a game to me and more like a compulsion. In fact, their attacks did no noticeable damage even though I parked the camper there for some time so that I could look for the Rock Wrens (Bird of the Week #438). According to my field guide ‘the worst offending birds are caught and transferred to distant sites or taken into captivity’. Sounds familiar. At one time, Keas were supposed to kill sheep, and the resulting bounty led to their persecution and decline. They have been fully protected since 1986 and the population is recovering. 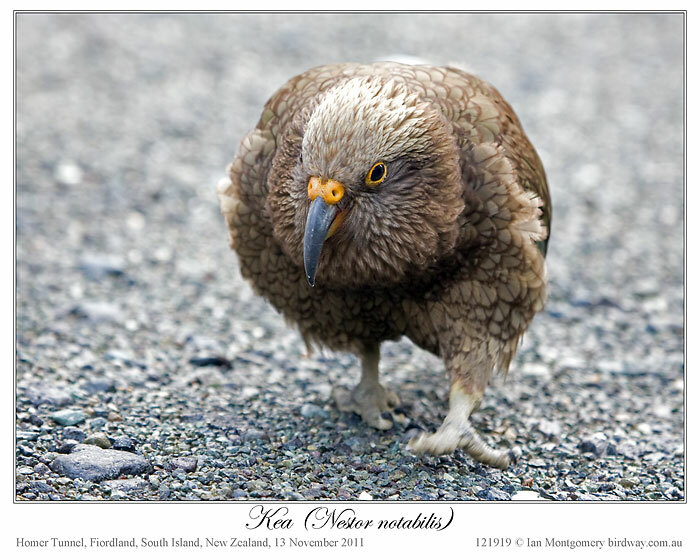 Keas are quite large birds, 46cm/18in in length and weighting up to 1Kg/2.2lbs. 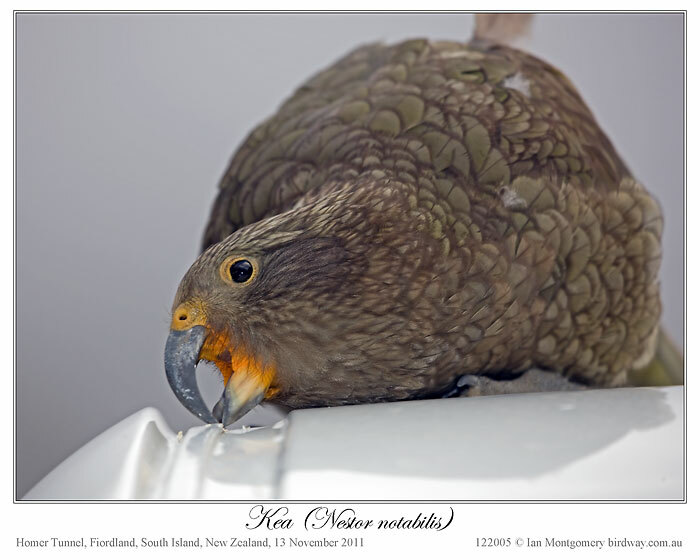 They and their relatives the Kaka and the Kakapo comprise a taxonomically distinct lineage of New Zealand parrots not closely related to any others and usually placed either in their own family (IOC) or sub-family (Birdlife International). While the flightless Kakapo is critically endangered and the subject of an intensive rescue mission http://www.kakaporecovery.org.nz/ , the Kea is quite common in Alpine areas of the South Island and the Kaka occurs in the forests of both islands, though I failed to find it on this trip. It’s good to leave something for the next visit. Sounds like you might want to keep an eye on your personal property around those birds! It is amazing how much the birds vary in their habits and diets. Every time Ian writes about his encounters with the various birds, it’s always different and interesting. 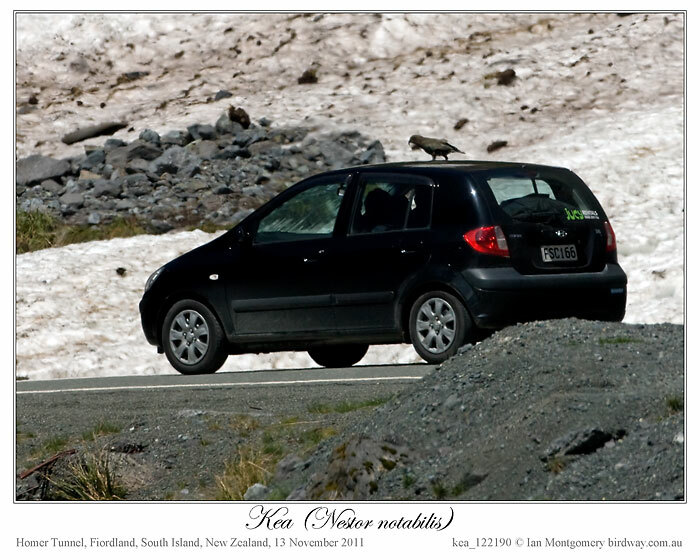 Keep up the great birding, Ian, we enjoy your encounters with our avian friends around the world. 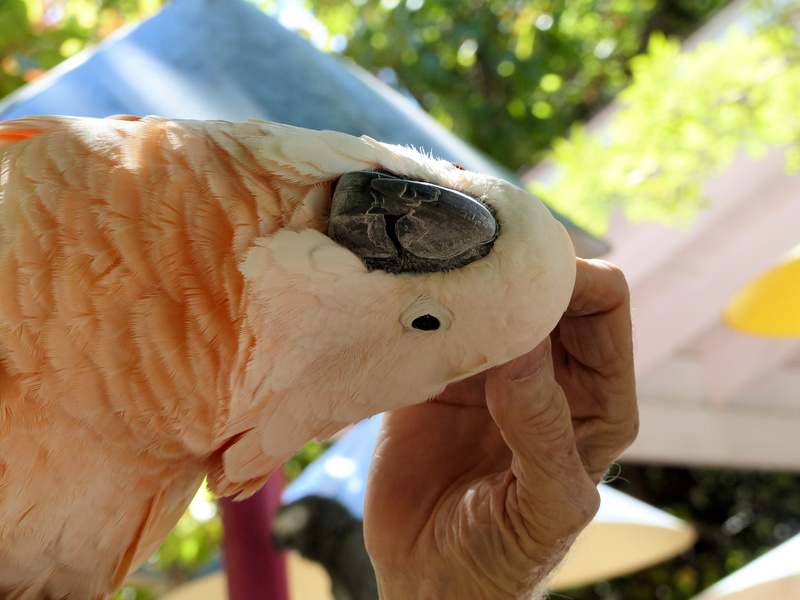 See Ian’s Cockatoos & Allies and his Parrots & Allies, which are part of the Strigopidae Family. 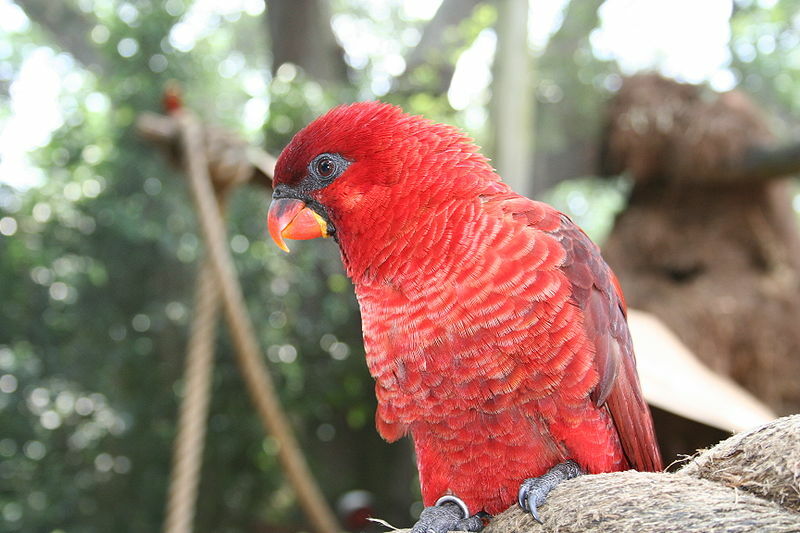 Those parrots along with the Cockatoos – Cacatuidae and Parrots – Psittacidae Families make up the Psittaciformes Order. Since there are so many birds that could be seen by our team in Peru and Chile, I have saved two large families for Part II. 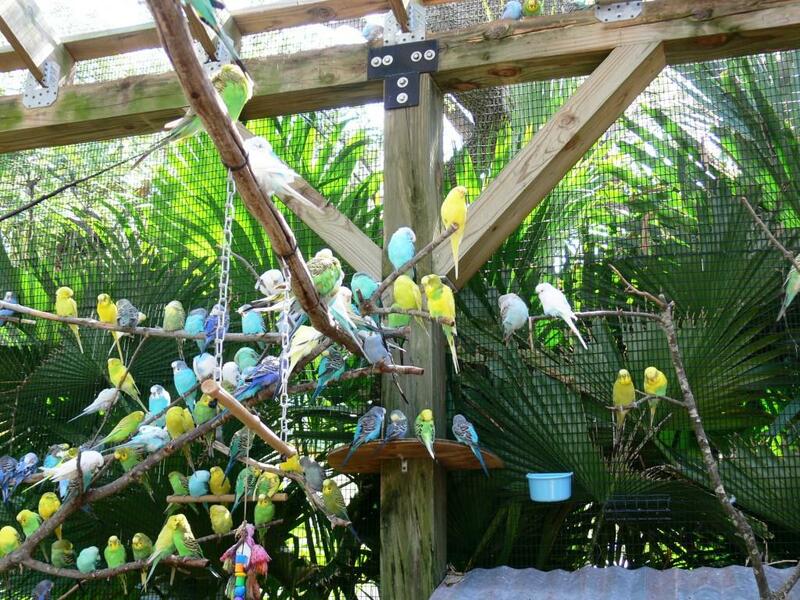 The Psittacidae Family which has the Parrots, Macaws, Parakeets, Parrotlets and the Amazons. There are 53 species in Peru and 5 in Chile. 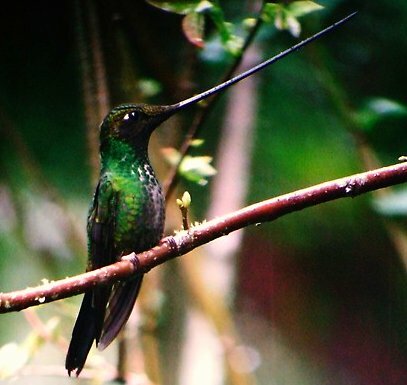 We did an article about the Sword-billed Hummingbird and maybe they will get to see one of them. The Trochillidae Family which has the Hummingbirds, Sicklebills, Hermits, Lancebills, Sabrewings, Jacobin, Violetears, Mangos, Topaz, Coquettes, Thorntails, Sapphires, Woodnymphs, Goldenthroat, Emerald, Plumeleteer, Piedtails, Brilliants, Coronet, Sunbeams, Velvetbreast, Inca, Starfrontlets, Sapphirewing, Sunangel, Pufflegs, Whitetip, Racket-tail, Comets, Mountaineer, Metaltail, Thornbills, Avocetbill, Fairy, Spatuletail, Sheartail and Woodstar. All of these are in the Hummingbird family. There are 123 species in Peru and 9 in Chile. The two country’s birds are combined in the slideshow. These two countries abound in the Creative Hand of the Lord, especially when the birds of the air are observed. 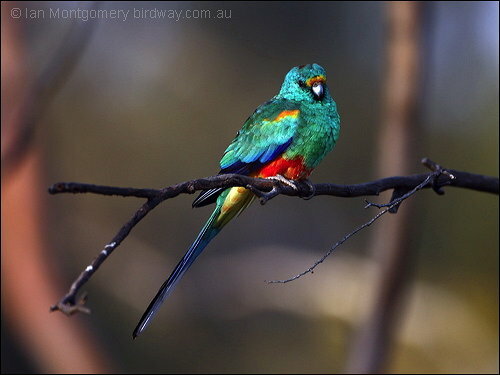 Maybe I was tempting fate when last week I publicly declared my target species of the Pilliga trip to be the Turquoise Parrot, but fate was kind to me when I did the same thing with the Resplendent Quetzal on the eve of my visit to Costa Rica last year. 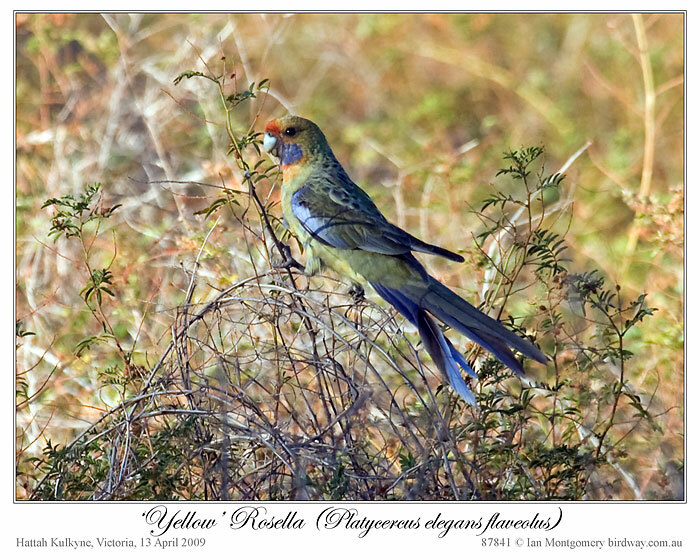 In truth I felt I needed a bit of help as I’ve been wanting to get reasonable photographs of these gorgeous birds since taking a very poor one of a female in the Warrumbungles in New South Wales in pre-digital days almost exactly eleven years ago. 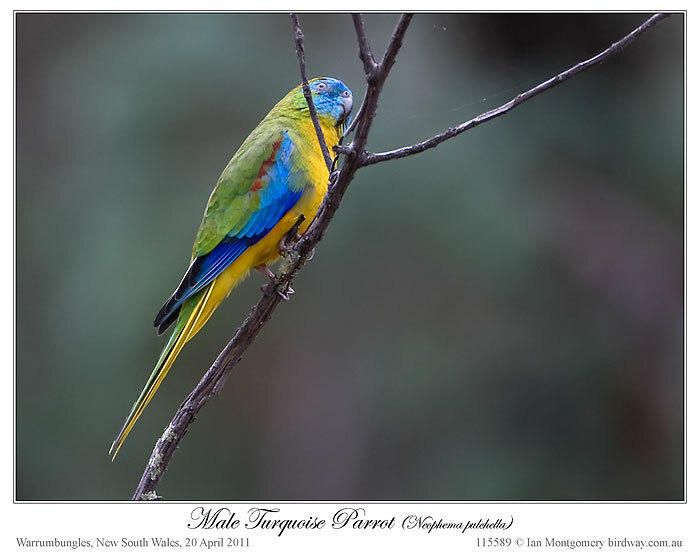 To that end I’d visited both the Warrumbungles and the Capertee Valley west of Sydney several times over the years, detoured via Warwick in Southern Queensland and camped the night in Chiltern in Northern Victoria, all places where this species has been reported. We went to the Warrumbungles last Wednesday and we were just about to leave the second site – the Woolshed – recommended by a helpful but not optimistic ranger (‘they haven’t been seen for a month or two’) when Ivor, one of my two sharp-eyed companions, spotted a female on exactly the same powerlines as eleven years ago, but this time she flew off towards the creek without waiting to have her photo taken. A careful search of the creek revealed nothing even vaguely turquoise but eventually we found about 20 birds feeding on the grassy track on the far side. I spent about 20 minutes sidling up to these birds as gradually as possible. The first two photos are of adult male birds, distinguishable by the reddish shouldered patches, which flew up into a shrub as I approached. The second male seems to be eyeing me quizzically as if wondering what I’m up to. The third photo is of a female feeding on the path. Misión completa, as they said in Costa Rica, and thank you, fate. What a gorgeous parrot. Wow! I know last week when Ian said he was off on an adventure to find that Turquoise Parrot, I prayed and asked that he find one. I was being a little selfish because I had never seen one and was trusting that his group would spot one. Whichever, fate or prayer, it is a choice we all make. I prefer the later. 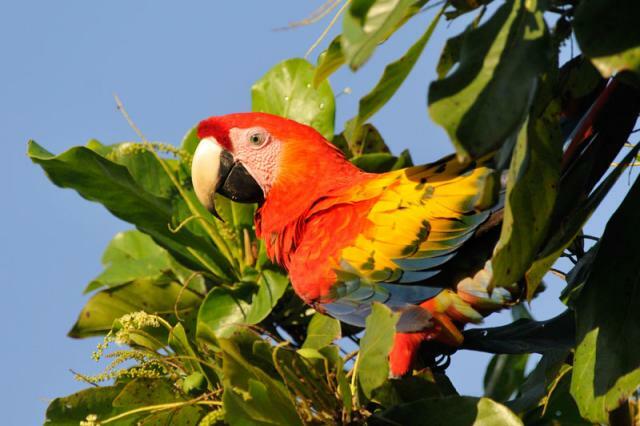 The parrots are in the Psittacidae – Parrots Family of the Psittaciformes Order. See all of Ian’s Bird of the Week articles. 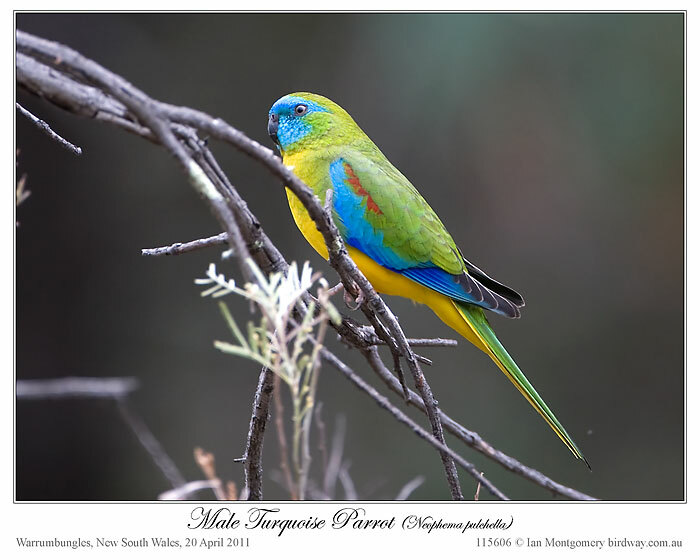 The Hooded Parrot featured as bird of the week at the end September following our encounter with some at Pine Creek in the Northern Territory. 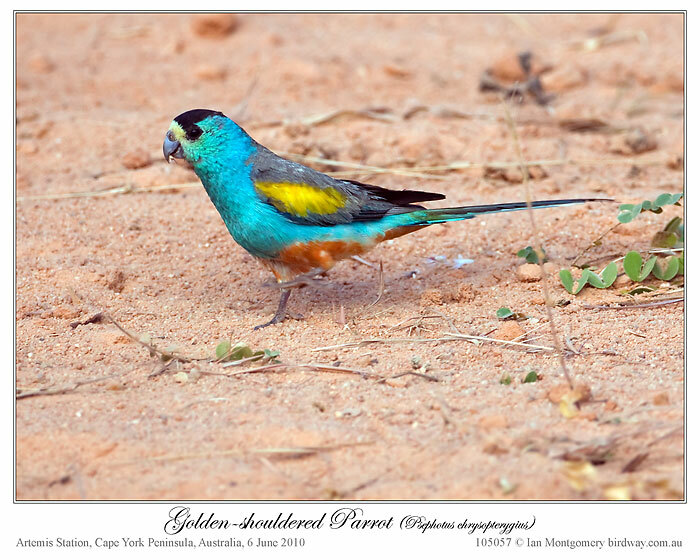 This week we have its rarer, and just as beautiful, close relative the Golden-shouldered Parrot of Cape York Peninsula, which we saw last week on our way back from Iron Range. We were shown them coming in to drink at a dam at sunrise by Sue Shephard of Artemis Station south of Musgrave. The two species look very similar. Male Golden-shouldered Parrots have narrower black caps, not extending past the eye, a yellowish forehead and, despite their name, a smaller golden patch on the wing. 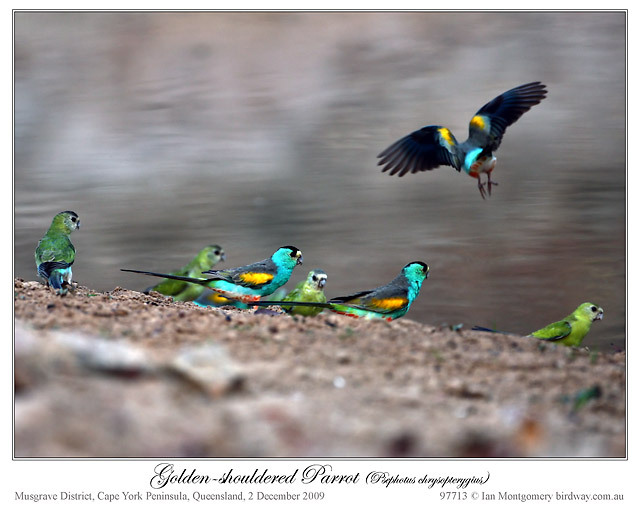 These shoulder patches are very obvious in flight, as in the bird top right in the first photo, and presumably act, along with the turquoise rump, as signals to other members of the species. At about 26cm/10in in length, these are both quite small parrots. 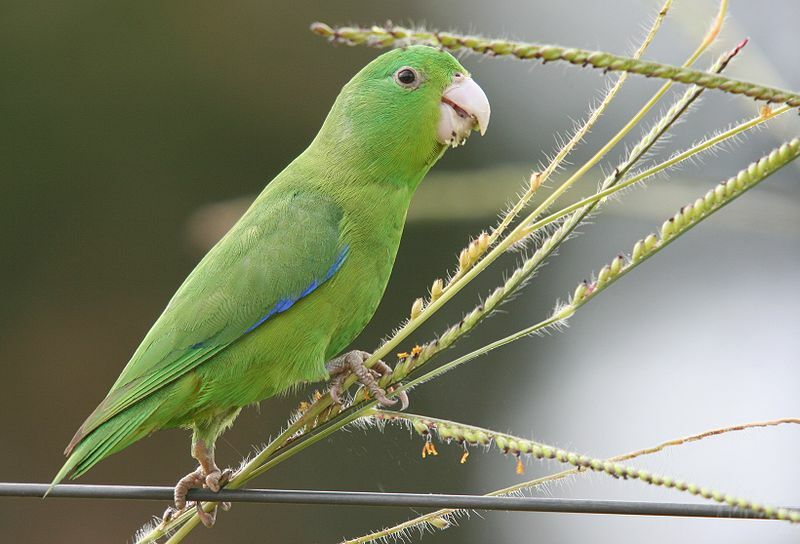 Like the extinct, closely related, Paradise Parrot of southeastern Queensland, all three species nest, or nested, in terrestrial termite mounds. 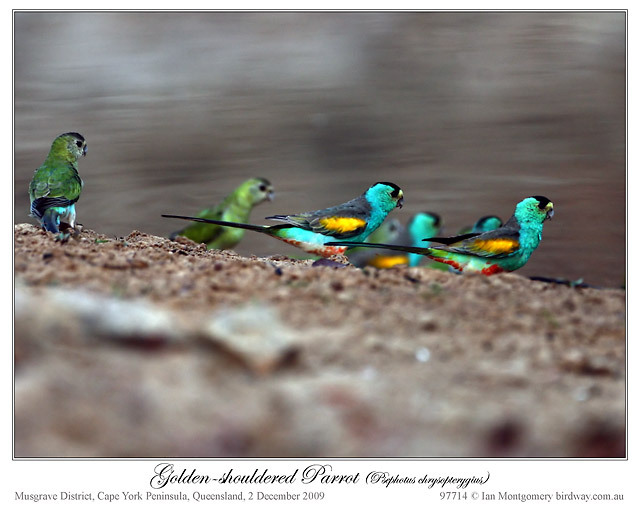 The Golden-shouldered Parrot used to be quite widespread on Cape York Peninsula. It is now found only in two areas: in the Morehead River catchment south of Musgrave (where we saw them) and in Staaten River National Park farther to the southwest. Population estimates range up to 1,000 pairs and the species, classified as endangered, is now the subject of a national recovery plan. The good news is that in the last decade the contraction of the range appears to have stopped and the population stabilized, owing to active conservation measures being taken by the holders of grazing properties in the Morehead River catchment, notably Tom and Sue Shephard of Artemis Station. Staaten River National Park is inaccessible by road, so monitoring and conservation there pose particular challenges. Another neat bird that Ian has captured in photos for us to enjoy. Thanks again, Ian. 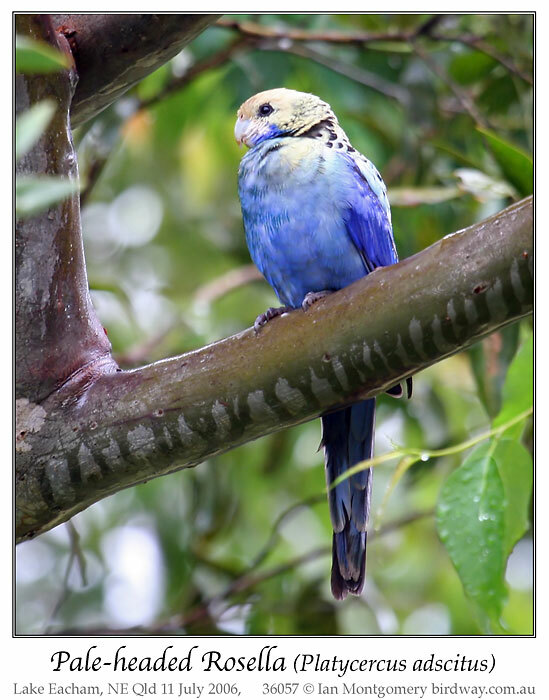 The Golden-shouldered Parrot is in the Psittacidae Family (Parrots) of the Psittaciformes Order (New Zealand Parrots, Cockatoos, and Parrots).